Apple's Swift has been available for over a year now, and Apple has promised it will be made available under an Open-Source license by the end of 2015. 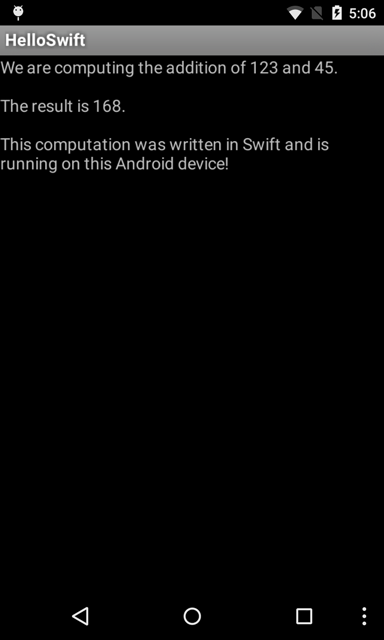 That's great, but can I run Swift code on an Android device today? Given they were both designed by the awesome Chris Lattner, it is not a surprise to discover that Swift's compiler is built on top of LLVM. LLVM is a compiler infrastructure that leverages the very interesting concept of a retargetable compiler. Namely, instead of generating machine code targetting a specific architecture, LLVM generates assembly code for an imaginary machine, and then converts that intermediate representation to actual code for whichever architecture we're interested in. That modular design is very smart since it allows for high code reuse (sharing optimizations and backends among frontends). There are some excellent resources on the net if you want to know more about LLVM. But wait, if LLVM is so modular, couldn't we use a different backend and generate binary code for something that is not OS X or iOS? Android maybe? Well, turns out you can! Let's see how. Ha, that's interesting! So apparently Swift mangles symbols kind of like C++. Indeed, the print function wasn't resolved to a _print symbol but to a much more convoluted __TFSs5printFTGSaP__9separatorSS10terminatorSS_T_ list of symbols. There's also a bunch of other symbols required too, that seem to deal with string conversion and memory handling. This is indeed the most common case so it makes sense for the compiler to do both at once. But we want to generate some an ARM ELF file (this is the binary format used on Android). Note: We have to add a "grep" filter to remove some iOS-specific metadata added by the Swift compiler. Great, so now we have just built an ARM ELF object file! Generally speaking, the NDK makes sense only for a small percentage of apps, so in the general case Google advises against trying to write a whole Android app using the NDK. And of course since we're missing the SwiftCore library this is restricted to a small subset of Swift. Last but not least, I've made published a working demo on GitHub if you guys want to experiment with this!